More time and effort is spent (wasted) on convincing investors that they can achieve good returns without experiencing the risk that comes along with those returns. Market timing, stock selection, bond-heavy allocations with extreme small cap value stock "tilts," black-box alternatives that supposedly "diversify" a portfolio without impairing returns; these ploys are so common they've become standard investing techniques and are even perceived as "sophisticated." But the chart above reveals the truth: stocks have had extremely high long-term returns precisely because they're extremely volatile in the short run. 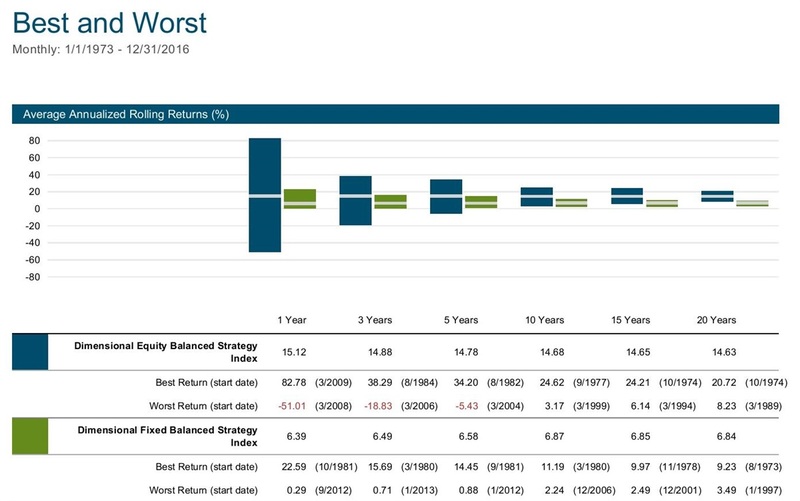 Short-term bonds have had extremely low short-term volatility and considerably lower long-term returns. In other words -- risk and return are related. There's stuff in the middle, of course, but it's just redundant. Figuring out what returns you need to achieve on your savings, and understanding how much short-term volatility and loss you have to accept to get those returns are the two fundamental pillars of investing. Start with the truth, and you'll be far less surprised when things don't always go your way.